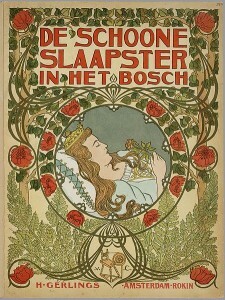 “De schoone slaapster in het bosch”, an interpretation of the story of Sleeping Beauty. 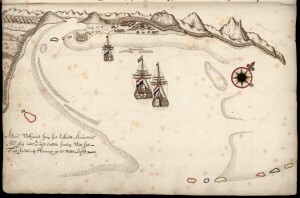 From the collection of the Koninklijke Bibliotheek. The past decade for libraries and archives have been hard. The ongoing digitisation of virtually everything that was once analog has led to confusion and soul searching for many of these GLAM’s (Galleries, Libraries, Archives and Musea): if their core mission is no longer about physical but virtual objects, what does it mean for their future? At the same time, other initiatives have sprung up that compete with the traditional roles of these institutions. Wikipedia, being the 6th largest global website and the biggest reference work in the world, is perhaps the most important initiative in that respect. It makes sense therefore to combine the two: why not have somebody from Wikipedia that can create a two-way relationship between the institution and the Wikipedia community? I’ve been doing exactly that since october 7th as the first Dutch Wikipedian in Residence for the National Library (Koninklijke Bibliotheek, KB) and the National Archive (Nationaal Archief, NA). This blog post is a summary of what i’ve learned and encountered in those first two months. Together the National Library and National Archive have more than 220 kilometers of objects (that’s roughly the distance from Amsterdam to Brussels). That immediately raises the question: what small part of this huge collection should i focus on? Fortunately i’m not the only one to decide. Together with collection specialists from both institutions, and many volunteers from Wikipedia i’m narrowing down the virtually endless list of options: among others, medieval illuminated manuscripts, historic maps and children’s picture books will all be part of some activity during my residency. Another important part of my residency here is the so-called ‘evangelism’ of all the concepts that float around Wikipedia: free licenses, no original research, ‘what is encyclopaedic?’, etcetera. In the two months that i’ve been working here more than 60 employees from the KB and NA have been following one of my five Wikipedia introductory courses where people learn both the ideas behind the encyclopedia and the practical side (how to edit). Of course, i do not have the illusion that all of those 60 attendees will be full-time Wikipedia volunteers after a three-hour course, but it helps to create a sort of ‘baseline’ of common knowledge and goodwill. I don’t need to explain anymore why Wikipedia works the way it does after enough people have attended one of the courses. Obviously, i do hope some people will become regular Wikipedia contributors. But for that, we’ll probably going to need some more ‘advanced’ courses (those will follow in the beginning of 2014). Still, we have some promising results after four workshops. Since i started here on October 7th, more than 170 edits have been made by people who attended one of the courses. 84 individual articles have been edited or created by KB/NA employees since i started here as a direct result of these courses. 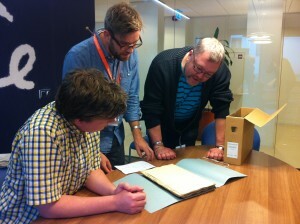 Wikipedians Ronn and Effeietsanders at the National Archive. Apart from giving courses to employees one of my other tasks is getting in contact with any Wikipedians that want to use the resources and objects in the KB/NA collection. Wikipedians Ronn and Effeietsanders (see photo) are working on improving all the articles related to the States-General (the Dutch legislature). Both the KB and NA have important documents related to the history of the States-General (going back to 1464) , and i was happy to help them with finding documents and directing their specific questions to the specialists about this subject. Another nice example of how i’m working together with Wikipedians: a user asked for photos of the Wire of Death, a lethal electric fence on the Dutch-Belgian border during the First World War. Spaarnestad Photo, that resides in the building of the National Archive, has the copyright on seven of these photographs. I asked if they would be willing to release these photos (in low resolution) under a CC-BY-SA license, and fortunately they did. I don’t the think the user would have had any success without an intervention by somebody who worked next door to the Spaarnestad managing director. Another way for Wikipedians to explore the collection of the KB & NA will be during the Wikimedia New Year’s Reception, which will be held at the institutions on January 18th 2014. A nice time to present some of the results of the WiR program as well. For now i’m focusing on finishing the last course for employees. Where the last three months of 2013 were about looking inside, 2014 will be about looking behind the walls of the archive and library. I’ll be organising edit-a-thons for anyone that wants to use the collections of the KB and NA to expand Wikipedia articles. I will also be coordinating uploads of media files to Wikimedia Commons, and maybe even some data dumps for Wikidata. The biggest event will be something i’ve tentatively called Wiki Loves Maps: a full month of events dedicated to maps, cartography and the historic places and events that are depicted on those maps. The KB and NA have wonderful highlights in their collection, but for this project i want to look outside The Hague towards my peers. During my two months of residency three more Dutch Wikipedians in Residence have been announced: Hans Muller and Arie Sonneveld for the Scientific Library Working Group (WSWB) and Sandra Fauconnier for the Tropenmuseum and Academic Heritage Foundation (Stichting Academisch Erfgoed). All of their institutions have wonderful maps as well, and it would be silly not to use the opportunity of four WiR’s at the same time to organise something together. Besides that, the Dutch bookweek in March has travel as its theme this year, so that seems like a natural fit. If you have any comments or remarks please share them (anonymously) in the comments. And share this article on Facebook, Twitter, or your favourite social network. Great work Hay. I can’t wait to see how your work proceeds! I love Wiki Loves Maps! It sounds like a good way to connect to Wikimaps Nordic maps activities in 2014. We are planning to have a maps hackathon in the autumn, could that be Wiki Loves Maps? Let’s share our ideas! Thanks for your comments Sarah and Susanna! Will get in contact with you.